Practice VLSI questions and answers for interviews, campus placements, online tests, aptitude tests, quizzes and competitive exams. This set of VLSI Multiple Choice Questions & Answers focuses on “Scan Design Techniques-2”. Explanation: The serial shift register is driven using two non over-lapping clocks which can be controlled by primary inputs of the circuit. 2. Which is used to control the scan path movement? Explanation: Two clock signals are used to control the scan path movements through the shift register latches. Explanation: The circuit operation is independent of dynamic characteristics of the logic elements like rise time, fall time and propogation delays. 4. Which is not the function of LSSD method? Explanation: The advantages of LSSD are that it eliminates races and hazards, simplifies fault generation and fault simulation. Explanation: Boundary scan test involves scan path and self-testing to resolve the problems associated with boards carrying VLSI circuits. Explanation: The boundary scan path is provided with serial input and output pads and with appropriate clock pads. Explanation: The boundary scan path test the interconnection between the various chips on the board. 8. Boundary scan method takes lesser time on test pattern generation. Explanation: Boundary scan method takes lesser time on test pattern generation and application. 9. The disadvantage of boundary scan method is that the fault coverage is less. Explanation: The boundary scan test method is simplified and efficient and also its fault coverage is increased. 10. Which occupies lesser area? Explanation: Partial scan is derived from scan path technique and it consumes very less area. Explanation: The partial scan approach detects faults which are not detected by designer’s functional vectors. Explanation: In scan/set method, storage elements are not used to implement a scan path. A separate register is added to scan test data in and out. 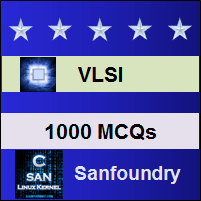 Sanfoundry Global Education & Learning Series – VLSI. To practice all areas of VLSI, here is complete set of 1000+ Multiple Choice Questions and Answers.